Tragi-comic love life of a young Australian footloose in Japan. Instead of attending university, Noah Tuttle has come to Tokyo with a fake diploma to scratch out a living as an English teacher. In a run-down, vermin-ridden hostel, he rooms with fellow Aussie Tilly, a sickly girl unforthcoming about her past. Then there’s Mami, a rich girl who lives in a glitzy suite in her father’s high-rise hotel. 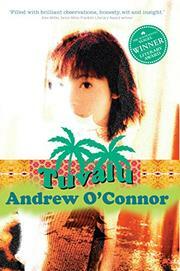 Tilly longs for an idealized Pacific island, Tuvalu. Rule-eschewing Mami steals, fakes suicide and in general apes the lifestyle of a Japanese SuperFreak. Her serendipitous encounters with Noah always leave him battered, physically and/or emotionally. Both Tilly and Noah are summoned home. Noah’s father, an ex-priest, panics when Noah’s mother becomes a live-in chef for a lesbian sculptor. Tilly’s biologist father is struggling to farm lavender and preserve endangered frogs. Noah and Tilly quarrel and he returns to Tokyo without her, falling once more into Mami’s clutches, and into the money-leaching schemes of scammer entrepreneur Harry. After a lackluster tour of Tokyo’s seedier hostess bars, the action picks up when Tilly returns, to find Noah with Mami. The hostel is being slowly demolished by “Deconstructionists” and its population of stray cats decimated. (Cat lovers, beware of certain pages.) Kicked out by Tilly, Noah is squatting in a nearby apartment mysteriously vacated by their former landlady. Justifiably horrified by the cat carnage, Tilly decamps for Australia for good. (We’ll learn later that her illness was not anorexia, but leukemia.) Mami is collared for shoplifting and goes into family-enforced exile, while Noah becomes embroiled in a marijuana operation with former hostel mate Phillip, a now disfigured ex-model who had “the sort of jaw that propped up whole lines of cologne.” Against his better instincts, Noah embraces Mami as his own personal Tuvalu. The ending, intended to be ambiguous, will not be if “rules” of character consistency hold true. Redeemed from jejune first-novel fatuousness by apt imagery and pervasive wit.